With almost three times the output of its predecessor, the new LED Lenser M7RX combines increased performance with the versatility of the original M7R. 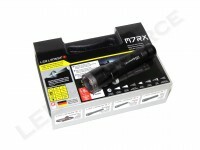 The M7RX has many unique features, including quick and easy focus adjustment, user-programmable function sets, and energy optimization schemes. 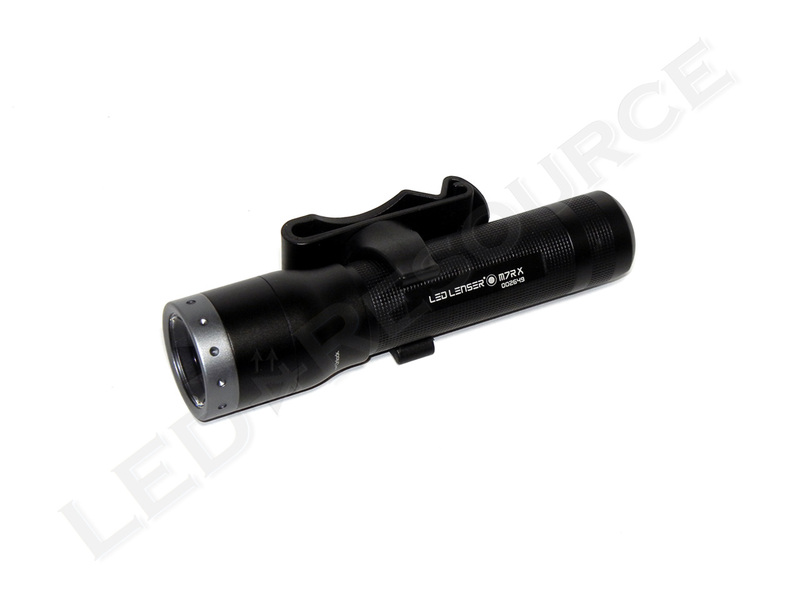 Up to 600 lumens is available in boost mode, which creates an impressive wall of light in flood focus, and runtime varies from two to five hours, depending on the Energy Management Mode. Weight with Batteries: 7.4 oz. 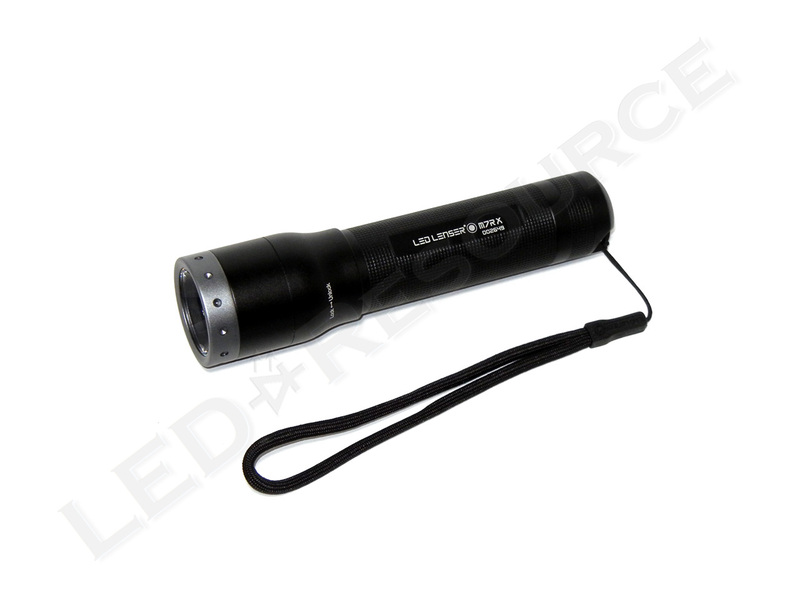 MSRP for the LED Lenser M7RX is $300, and the light is only available in black. 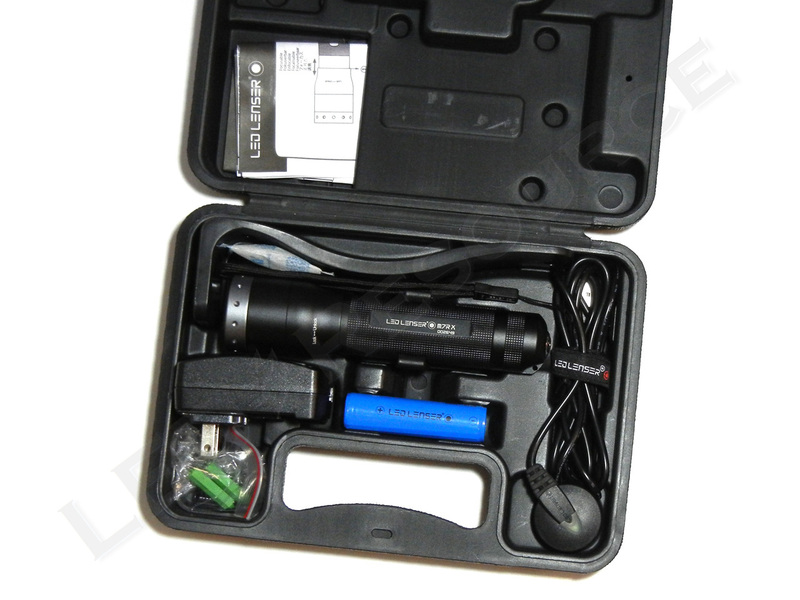 Included in the box (which is a carrying case) are: LED Lenser M7RX, Li-Ion rechargeable battery, USB magnetic charger, charger mount, 2 x mounting screws and sleeves, AC adapter, belt clip, lanyard, and user manual. A rechargeable 2200mAh lithium-ion battery is used in the M7RX, which uses a battery carrier that is attached to the tailcap. 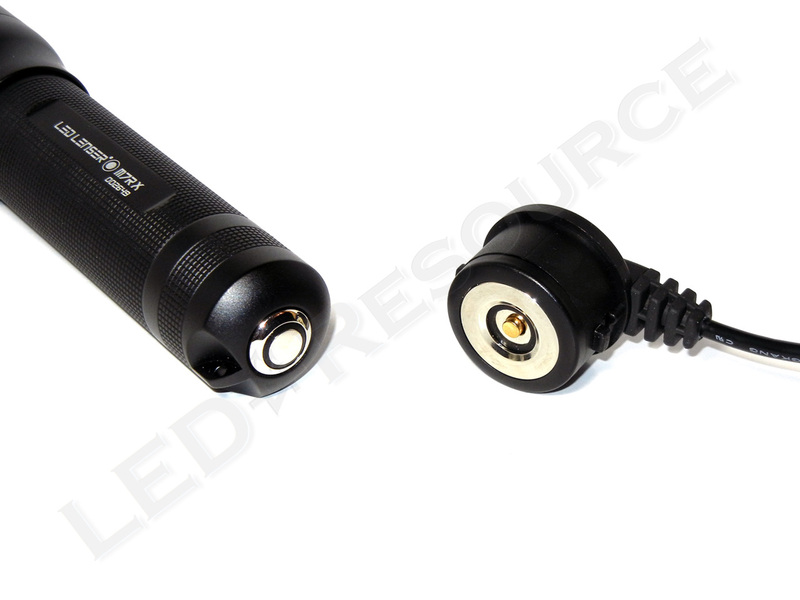 To charge the light, attach the tailcap to the magnetic charger. Charge time can take up to five hours. 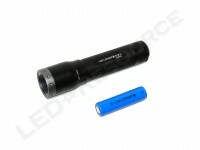 The M7RX is a tactical-sized light with a type-II anodized aluminum body, and the body diameter is slightly larger-than-average because of the battery carrier. 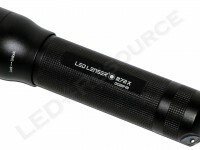 The light is easy to grip, especially if you have large hands. The grey bezel distinguishes the M7RX from the M7R, and the head features LED Lenser’s hallmark plastic total internal reflection optic. To adjust the focus of the light, the head can be pushed forwards for a tighter beam or backwards for a wider beam. 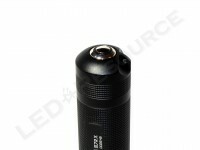 Light knurling along the body provides grip for the light. On the tail cap is a momentary-capable elecrtonic clicky switch, which also doubles as charging contacts. The switch is a little firm but has good tactile response and a solid, audible click. 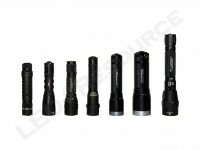 The LED Lenser M7RX features eight modes, which are divided into three function sets. Modes can be changed with a half press of the switch at any time. 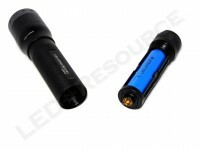 A half press of the switch activates boost mode for maximum output of 600 lumens. 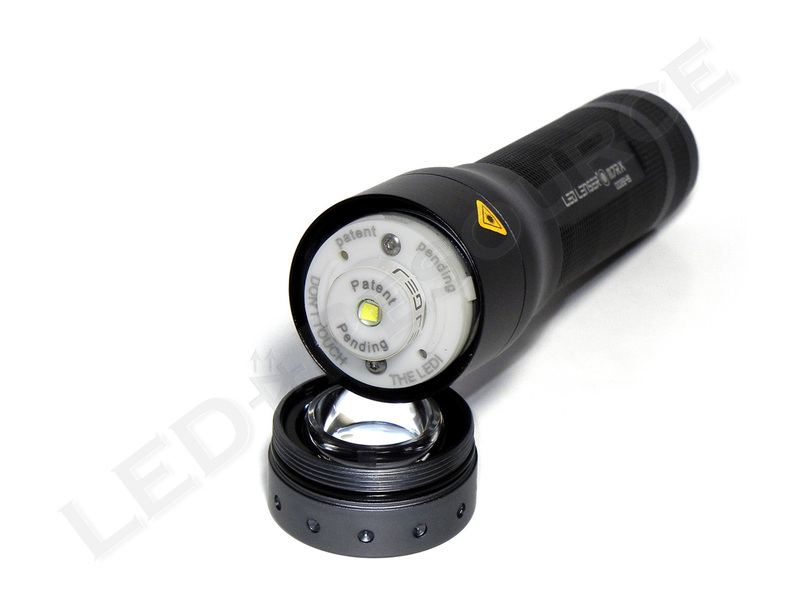 A full click activates power mode, which is approximately 400 lumens. 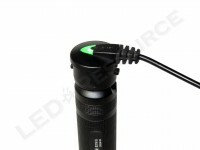 Professional and Easy: After turning the light on, hold the switch halfway to activate the adjustable dim mode. The light will continuously fade between low and high, and to select brightness level, release the switch. 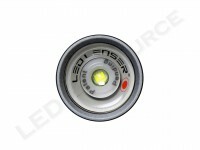 Professional and Easy: After turning the light on, a half press activates the 85 lumen low mode. Professional: After turning the light on, two half presses activates a 3Hz blink. Professional: After turning the light on, three half presses activates SOS mode. Professional: After turning the light on, four half presses activates a 20Hz strobe. Tactical: After turning the light on, a half press activates a 20Hz strobe. 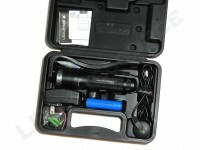 Function sets can be changed with four half presses followed by a full press, and the active function set is indicated by the number of flashes after the mode is changed. Professional mode enables all available modes. Easy mode is designed for simple operation, and only Boost, Power, Low, and Dim are available. Tactical mode is designed for quick activation of strobe, and only Boost, Power, and Strobe are available. 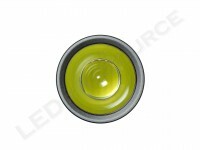 Energy management modes can be changed with eight half presses followed by a full press, and the active energy management mode is indicated by the way the light shuts off after the mode is changed. Output is reduced in two steps, from 100% to 35% in the first 10 minutes, then 35% for the next 25 minutes, then 15% for the rest of the runtime. Turning the light off will reset the step-down. Output is reduced in one step, from 100% to 40% in the first 10 minutes, then 40% for the rest of the runtime. Turning the light off will reset the step-down. Using a Cree XM-L LED, the M7RX has a maximum output of 600 lumens and 13,800 candela. Overall performance is similar to that of the M7R, except brighter and with a cleaner beam pattern. 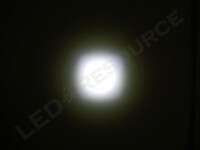 In spot mode, the beam pattern has a round hotspot and a square corona. In flood mode, the beam is completely smooth. 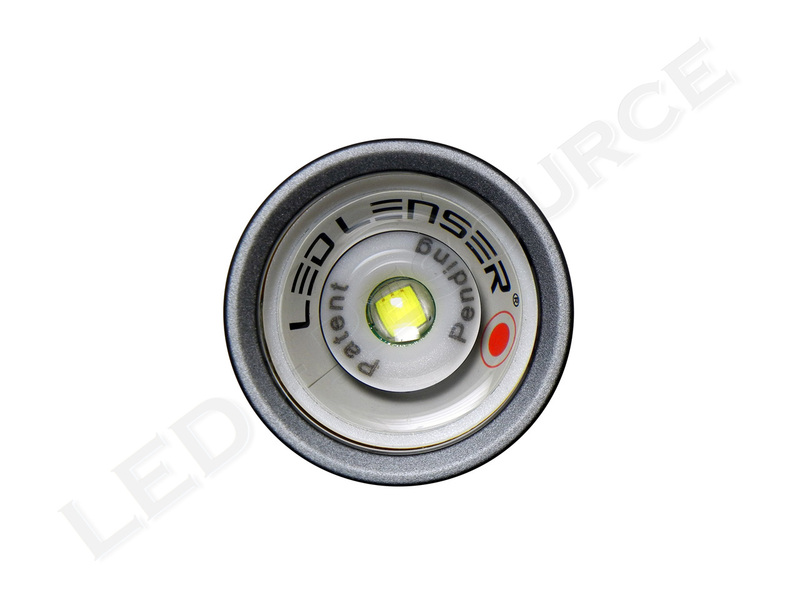 LED Lenser’s Rapid Focus system allows quick spot to focus adjustment, and simply twist the head to lock/unlock the bezel. Low battery is signaled by a 3Hz blink. The light is rated for IPX4 water-resistance, which means it can withstand splashing water from all directions.  Runtime depends on the Energy Management Mode that is selected, and the different behavior can easily be seen here. In Energy Save mode, the step-down behavior is more aggressive, while Constant Current mode maintains consistent output after the initial step-down. The M7RX comes with several accessories, including a mounting bracket, swiveling belt clip, and lanyard. In the LED Lenser M7RX, the 600 lumens of output are definitely put to good use. Both the spot and flood beams are excellent and artifact-free on the M7RX, compared to the M7R, which has a couple rings and bands in the beam. 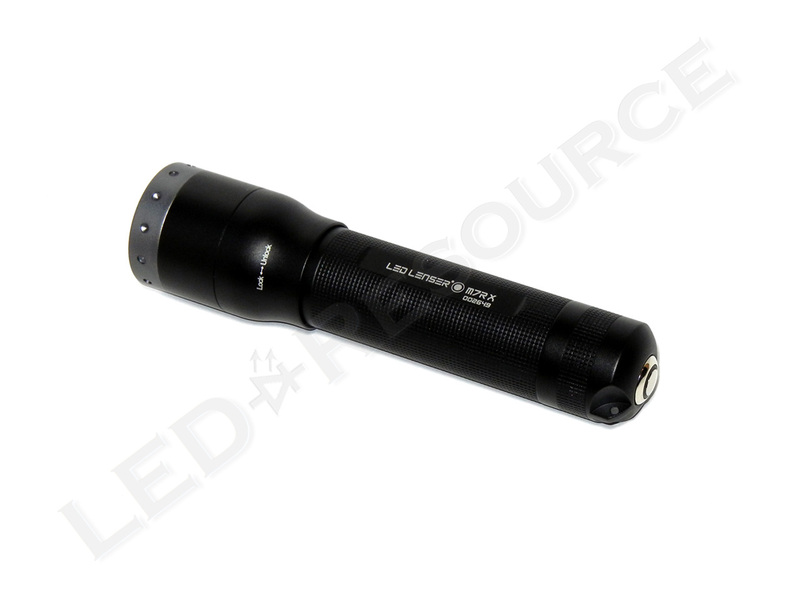 However, increased output in the M7RX also brought along an increased MSRP of $300, which makes this light quite costly. 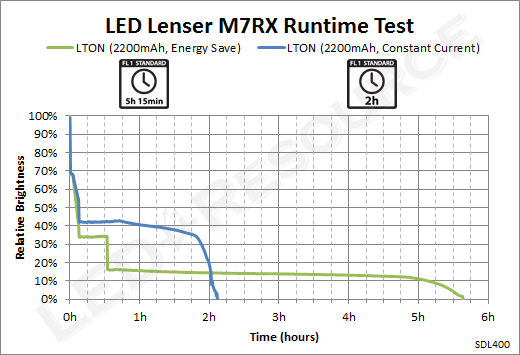 Actual retailer pricing is slightly lower, but the LED Lenser M7RX is an excellent multipurpose light that has many features not found in similar lights. 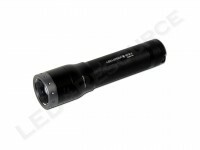 In response to Chris Rees, I have had the same issue with my M7RX. 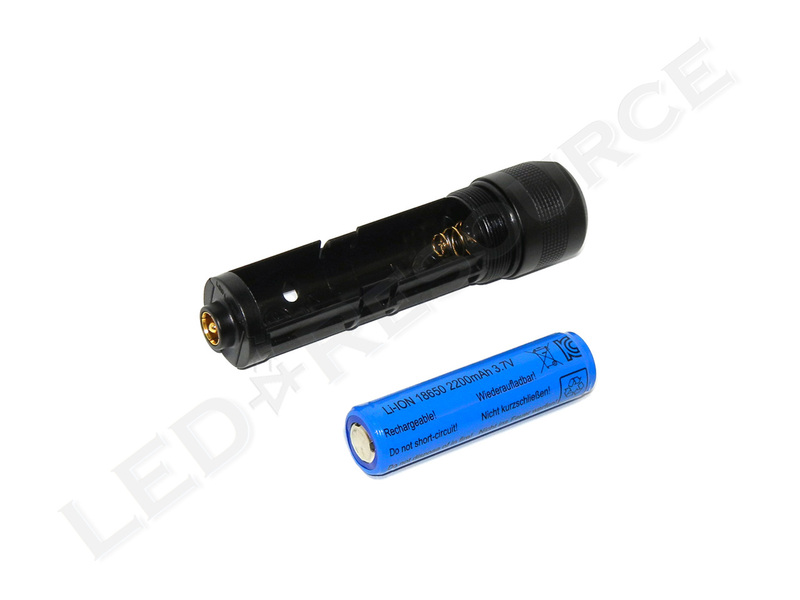 I swapped the battery out, and the issue went away. I suspect that it is a battery issue. (The battery that I swapped out was only giving 10min or less on high). I’ve had issues too. It won’t charge. In for repair now. Meanwhile I bought a fab defense t-grip weapon mount assuming the body is 1 inch. Not! Hope it will fit anyway. 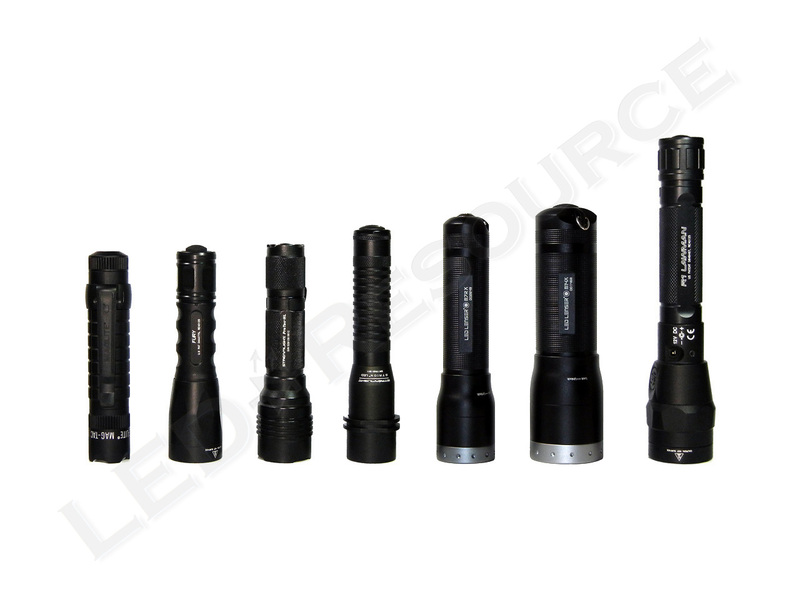 If not … Any tips for a 1 inch tactical light with preferrable strobe As First setting and tailcap switch? I can’t get the flashlight to charge (or it’s not working). The charger is putting off a blue light and there’s red ring, is that correct when charging? 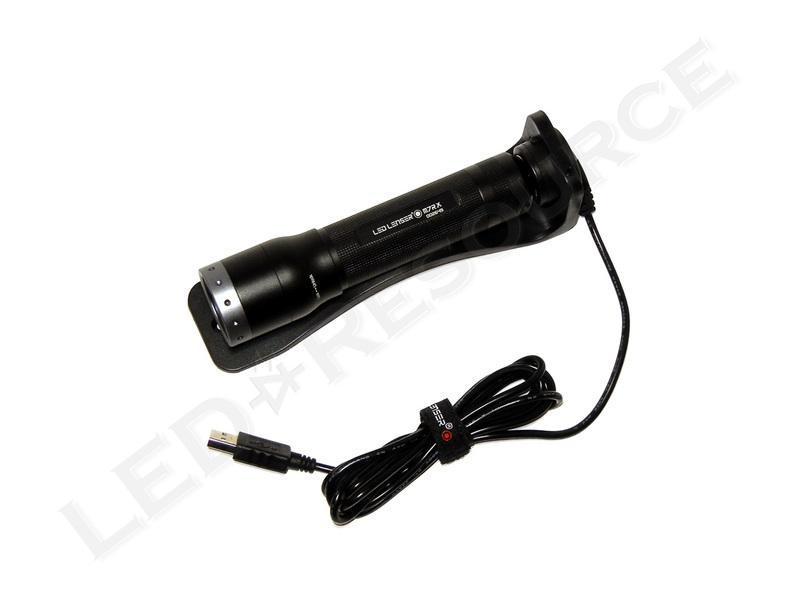 No matter how long I charge it, the flashlight won’t work. I have tried the usb in different chargers. Any suggestions? It’s approx 6 months old.